Full Professor in the Department of Family Medicine at the University of Sherbrooke in Quebec, a care of the elderly physician at Institut universitaire de gériatrie de Sherbrooke, and a researcher at the Centre de recherche sur le vieillissement in Sherbrooke. Objective To answer frequently asked questions about management of end-stage pneumonia, poor nutritional intake, and dehydration in advanced dementia. Sources of information Ovid MEDLINE was searched for relevant articles published until February 2015. No level I studies were identified; most articles provided level III evidence. The symptom management suggestions are partially based on recent participation in a Delphi procedure to develop a guideline for optimal symptom relief for patients with pneumonia and dementia. Main message Feeding tubes are not recommended for patients with end-stage dementia. Comfort feeding by hand is preferable. Use of parenteral hydration might be helpful but can also contribute to discomfort at the end of life. Withholding or withdrawing artificial nutrition and hydration is generally not associated with manifestations of discomfort if mouth care is adequate. Because pneumonia usually causes considerable discomfort, clinicians should pay attention to symptom control. Sedation for agitation is often useful in patients with dementia in the terminal phase. Conclusion Symptomatic care is an appropriate option for end-stage manifestations of advanced dementia. The proposed symptom management guidelines are based on a literature review and expert consensus. I introduced Mrs M., an 85-year-old woman with advanced dementia, in part 1 (page 330) of this 2-part review about end-of-life issues in advanced dementia, in which I discussed goals of care, the decision-making process, and how to educate families about therapeutic options.1 In this article, I will focus on symptom management and care issues at the end of life. Recurrent infections and poor nutritional intake are hallmarks of advanced dementia. The appropriate use of antibiotics and artificial nutrition and hydration (ANH) poses many clinical and ethical challenges for the treating physician. You and Mrs M.’s daughter have discussed the therapeutic options for Mrs M.’s probable end-stage pneumonia. She agrees that symptomatic care is the most appropriate option at this stage. However, she worries about the pain or discomfort her mother might experience from dehydration and starvation, as well as her pneumonia. This article is based on a review of literature about end-of-life care in advanced dementia. MEDLINE was searched for articles published until February 2015, containing the following MeSH terms: dementia and palliative care or terminal care; and dementia and pneumonia. A total of 41 articles were retrieved. The search was supplemented with review of related topics in the UpToDate database (www.uptodate.com). Loss of appetite and difficulties with eating and maintaining weight are almost universal and expected complications of progressive dementia, even when appropriately textured food and oral supplements are offered.3,4 Eating problems associated with dementia include difficulty chewing and swallowing, pocketing or spitting, and loss of interest in food. Swallowing problems often lead to aspiration events and pneumonia. Reversible causes of poor intake such as excessive drug sedation, altered mental status due to undetected dehydration, and painful swallowing due to thrush should be looked for and corrected whenever possible. Concern about the patient suffering from hunger and thirst is common among families considering tube feeding. Findings of studies in which terminally ill patients still capable of reporting their symptoms were interviewed show that, although it does not provide adequate nutrition, “comfort feeding” is able to eliminate feelings of hunger or thirst. Comfort feeding, or hand feeding, involves giving patients frequent small amounts of food, sips of liquids, or mouth care. This alternative is more aligned with comfort, allows social interaction, and avoids the complications of tube feeding. Cultural and moral standards often impede families from being able to withhold artificial support. Providers must explain to families that careful hand feeding should fill patients’ needs without subjecting them to invasive and nonbeneficial artificial feeding. There is still a risk of aspiration but it is minimized if the feeding is stopped when the patient shows signs of distress. Offer food and liquid as long as it is not distressing. Feed with the least invasive and potentially most satisfying method. Provide continuous interaction with the patient (eg, assiduous mouth care, conversation, therapeutic touch). In advanced dementia, the symptoms of dehydration are often nonspecific. It is not rare that dehydration is diagnosed only with marked degrees of volume depletion typically associated with hypernatremia and uremia. Although use of intravenous or subcutaneous clysis might be temporarily useful, many experts think that, in a terminal patient for whom hydration is of questionable value, it might be appropriate to withhold or withdraw this treatment in order to avoid discomfort (prolongation of dying, increased sputum retention).10 However, it must be acknowledged that there are different approaches worldwide that are dependent on the beliefs or attitudes of medical providers and local culture. A study of predictors of survival among 178 Dutch nursing home patients with dementia who had ANH withdrawn or withheld showed that 59% of patients died within 1 week. Patients who were considered more severely ill, had dyspnea, or experienced apathy were more likely to die within the week. Longest length of survival happened in patients who were still able to take small amounts of fluids.12 Another important finding is that the level of discomfort decreases in the days after the decision is made to forgo ANH. Most patients are probably asleep or comatose shortly before death. Because of the observational nature of the study and the lack of a reference group, conclusions should be drawn carefully. Nevertheless, it seems that forgoing ANH in patients with severe dementia who scarcely or no longer eat or drink is not associated with high levels of discomfort. 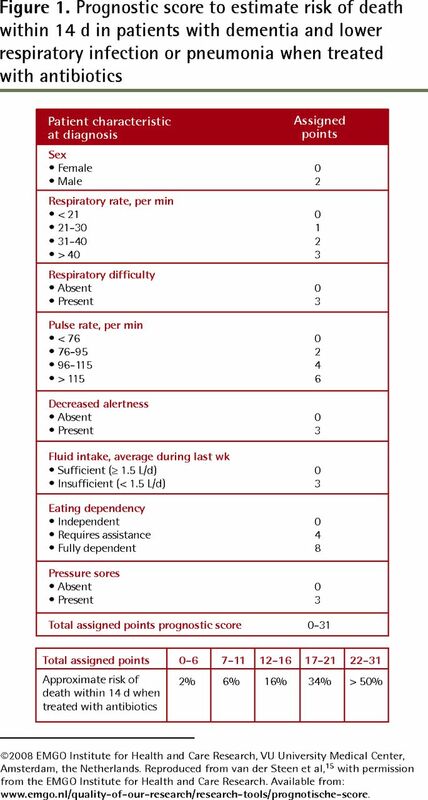 When the patient has very high dependency for activities of daily living, is bedridden, and has dysphagia,13 pneumonia is often the cause of death in the coming weeks or months even if antibiotics are prescribed.13,14 A prognostic score tool (Figure 1) might provide valuable information (both for physicians and family members) for deciding between symptomatic and curative treatment.15 However, decisions should be based primarily on goals of care, taking into account the burden of treatment and the patient’s wishes or best interests according to family and professional caregivers. ©2008 EMGO Institute for Health and Care Research, VU University Medical Center, Amsterdam, the Netherlands. Reproduced from van der Steen et al,15 with permission from the EMGO Institute for Health and Care Research. Available from: www.emgo.nl/quality-of-our-research/research-tools/prognotische-score. Patients who choke on food but have a good capacity to cough might survive aspiration “pneumonitis” caused by irritation of airways by gastric content. Aspiration pneumonitis21 occurs usually after a meal. It presents with acute dyspnea, tachypnea, tachycardia, and fever. It should be managed by raising the head of the bed, clearing the airways gently, providing oxygen therapy, and administering bronchodilators (if there is bronchospasm) and opioids to relieve respiratory distress. Those who can cough effectively often recover within 24 hours. However, many will develop bacterial pneumonia within a few days. Most often dyspnea is due to broncho-pneumonia, and a decision to prescribe or to withhold antibiotics has to be made. Opioids are the main symptomatic treatment of dyspnea. Benzodiazepines are helpful if there is anxiety or agitation or severe distress. Sometimes, the acute respiratory distress is due to acute pulmonary edema and should be managed with furosemide and a nitroglycerin patch if the systolic blood pressure is more than 90 mm Hg. Muscarinic receptor blockers are commonly used to control respiratory secretions. These drugs will minimize gurgling and crackling sounds and can be used prophylactically in the unconscious dying patient; however, there is controversy about their usefulness.2 Some evidence suggests that the earlier the treatment is initiated, the better it works, as larger amounts of secretions in the upper aerodigestive tract are more difficult to eliminate.27 However, premature use in the patient who is still alert might lead to unacceptable drying of oral and pharyngeal mucosa. Ensuring a good body posture (lateral or upright position) might facilitate drainage. In general, avoid suctioning because it might cause gagging or increased mucus production. Families might be disturbed by rattling sounds. Family members should be reassured that these are not burdensome to the comatose patient. Mrs M.’s daughter understands that comfort or hand feeding is preferable to tube feeding at this stage of the disease. She contributes to mouth care when she is present. She also understands how opioids, sedatives, etc, will be used to keep her mother as symptom free as possible. Mrs M. initially appears quite uncomfortable and is treated with regular small doses of opioids, scopolamine, and lorazepam. She is now sleeping and comfortable. The family has time to gather and offer her daughter some relief. Mrs M. dies peacefully 4 days later. The appropriate use of ANH and antibiotics poses many clinical and ethical challenges for the treating physician. Providing a comfort feeding–only order offers a clear goal-oriented alternative to tube feeding. Withholding or withdrawing ANH is generally not associated with manifestations of discomfort if mouth care is adequate. Because pneumonia usually causes considerable discomfort, clinicians should pay attention to symptom control. Palliative “symptomatic care only” is an appropriate option for end-stage manifestations of advanced dementia. Dr Arcand received a Visiting Scholar Fellowship from the University of British Columbia arm of the Canadian Dementia Knowledge Translation Network (Canadian Institutes of Health Research DIP #87302) and support from the National Core for Neuroethics at the University of British Columbia. For patients with end-stage dementia, comfort feeding by hand is preferable to tube feeding, as it is aligned with comfort, allows social interaction, and avoids complications of tube feeding. A “comfort feeding only” order can provide steps to ensure a patient’s comfort through an individualized feeding care plan. Patients with advanced dementia might find the effort to eat and drink draining or unwelcome and should not be pressured to make this effort. Symptoms of dry mouth and thirst can be alleviated with mouth care consisting of oral cleaning with swabs and lubrication. Antibiotics are sometimes prescribed to patients with dementia and end-stage pneumonia to increase comfort even when death is imminent. Withholding antibiotics might be more appropriate if the goal of care is symptom control without life prolongation. La traduction en français de cet article se trouve à www.cfp.ca dans la table des matières du numéro d’avril 2015 à la page e183.
. End-of-life issues in advanced dementia. Part 1: goals of care, decision-making process, and family education. Can Fam Physician 2015;61:330-4. (Eng), e178–82 (Fr).
. Development of a practice guideline for optimal symptom relief for patients with pneumonia and dementia in nursing homes using a Delphi study. Int J Geriatr Psychiatry 2014 Jul 7. Epub ahead of print.
. Medical care in skilled nursing facilities (SNFs) in the United States. Waltham, MA: UpToDate; 2015.
. Palliative care: nursing home. Waltham, MA: UpToDate; 2013.
. Evidence-based approach to management of fever in patients with end-stage dementia. J Palliat Med 2003;6(3):351-4.
. Tube feeding in patients with advanced dementia: a review of the evidence. JAMA 1999;282(14):1365-70.
. Natural history of feeding-tube use in nursing home residents with advanced dementia. J Am Med Dir Assoc 2009;10(4):264-70. Epub 2009 Jan 9.
. Decision-making and outcomes of feeding tube insertion: a five-state study. J Am Geriatr Soc 2011;59(5):881-6. Epub 2011 May 3.
. Comfort feeding only: a proposal to bring clarity to decision-making regarding difficulty with eating for persons with advanced dementia. J Am Geriatr Soc 2010;58(3):580-4.
. Stopping nutrition and hydration at the end of life. Waltham, MA: UpToDate; 2013.
. Competency in end-of-life care: last hours of life. J Palliat Med 2003;6(4):605-13.
. Discomfort in nursing home patients with severe dementia in whom artificial nutrition and hydration is forgone. Arch Intern Med 2005;165(15):1729-35.
. The clinical course of advanced dementia. N Engl J Med 2009;361(16):1529-38.
. Antibiotics and mortality in patients with lower respiratory infection and advanced dementia. J Am Med Dir Assoc 2012;13(2):156-61. Epub 2010 Oct 8.
. A validated risk score to estimate mortality risk in patients with dementia and pneumonia: barriers to clinical impact. Int Psychogeriatr 2011;23(1):31-43. Epub 2010 Jul 26.
. Pneumonia: the demented patient’s best friend? Discomfort after starting or withholding antibiotic treatment. J Am Geriatr Soc 2002;50(10):1681-8.
. Discomfort in dementia patients dying from pneumonia and its relief by antibiotics. Scand J Infect Dis 2009;41(2):143-51.
. Survival and comfort after treatment of pneumonia in advanced dementia. Arch Intern Med 2010;170(13):1102-7. Erratum in: Arch Intern Med 2011;171(3):217.
. Palliative care formulary (PCF4). 4th ed. Nottingham, UK: Palliativedrugs.com Ltd; 2011.
. Arrêt des médicaments en soins palliatifs. In: Association des pharmaciens des établissements de santé du Québec, editor. Guide pratique des soins palliatifs. 4th ed. Montreal, QC: Association des pharmaciens des établissements de santé du Québec;; 2008. p. 337-53.
. Aspiration syndromes: aspiration pneumonia and pneumonitis. Hosp Pract 2010;38(1):35-42.
. Development and preliminary validation of the Pain Assessment Checklist for Seniors with Limited Ability to Communicate (PACSLAC). Pain Manag Nurs 2004;5(1):37-49.
. Validité et utilité clinique d’une grille d’observation (PACSLAC-F) pour évaluer la douleur chez des aînés atteints de démence vivant en milieu de soins de longue durée. Can J Aging 2008;27(1):45-55.
. Development and psychometric evaluation of the pain assessment in advanced dementia (PAINAD) scale. J Am Med Dir Assoc 2003;4(1):9-15.
. Withholding, discontinuing and withdrawing medications in dementia patients at the end of life: a neglected problem in the disadvantaged dying? Drugs Aging 2010;27(6):435-49.
. Sedative use in the last week of life and the implications for end-of-life decision making. Arch Intern Med 2003;163(3):341-4.
. Using anti-muscarinic drugs in the management of death rattle: evidence-based guidelines for palliative care. Palliat Med 2002;16(5):369-74.
. Use of oxygen at the end of life: on what basis are decisions made? Int J Palliat Nurs 2012;18(8):369-70, 372.